President Donald Trump said Tuesday that his inaugural summit with Russian strongman Vladimir Putin was better than the one he held last week with traditional US allies in NATO. “While I had a great meeting with NATO, raising vast amounts of money, I had an even better meeting with Vladimir Putin of Russia. Sadly, it is not being reported that way – the Fake News is going Crazy!” Trump tweeted. 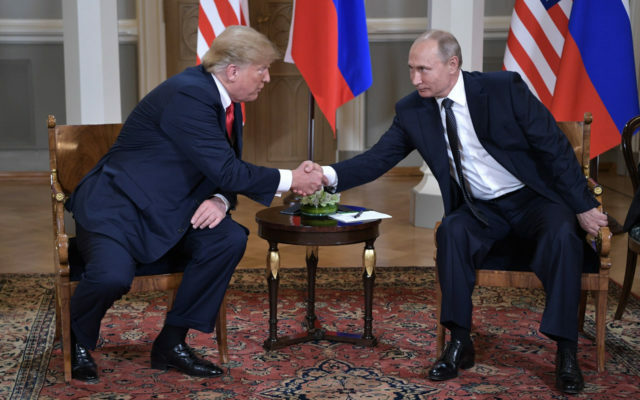 Trump’s meeting with NATO allies last week — at which he sharply criticized them over defense spending — was seen as having badly strained trans-Atlantic ties, in sharp contrast to the amity on display when the US president met Putin on Monday. At a joint news conference, Trump appeared to take the Russian leader’s word over that of US intelligence that Moscow did not interfere in the 2016 US presidential election — drawing widespread criticism at home. Standing alongside the Kremlin boss, Trump acknowledged that his intelligence chiefs believe Russia hacked and leaked Democrats’ emails containing politically damaging information about his rival Hillary Clinton.